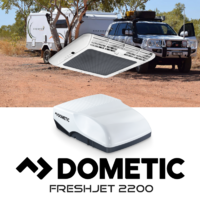 The ALL NEW SUPER QUIET 2018 Model Dometic Harrier Inverter type Air Conditioner is currently revolutionising the caravan and motorhome industry with its BIG capacity / Low average amperage draw Inverter type Air Conditioner. This Caravan Air Conditioner has a variable speed compressor with soft start inverter technology that allows quieter and more energy effecient operation. This essentially means that this unit will require less generator power to operate than other models of air conditioners in its class. Suitable for caravans and motorhomes up to 8m in length internally, this unit comes with an adapter to suit both 360mm x 360mm and 400mm x 400mm roof cut outs. 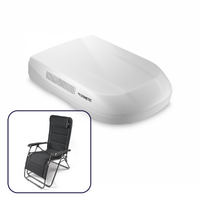 A light weight and slim low line designed top unit allows more versatility with height restrictions and actual weight placed on the roof of your Caravan or Motorhome. 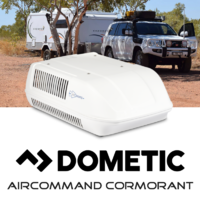 The Dometic Harrier Inverter also has a number of useful comfort features including remote controlled oscillating vents for effective air distribution and cold plasma air purification. An innovative sleep mode function reduces the compressor speed, in addition to the usual fan speeds, to further reduce noise and vibration levels while sleeping. 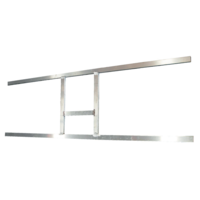 A H-Frame Support may be required to strengthen your roof to carry the extra weight of the Air Conditioner, just check with your manufacturer if this is required. A thickness adapter is also available for roof thicknesses of between 60mm and 108mm. 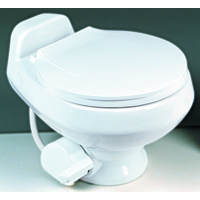 Please contact us at sales@caravanRVcamping.com if you require this item. Take a look at our whole range of caravan air conditioners here! We've just had this fitted to our caravan. It's a very quiet unit and runs off our Honda generator EU2.0i easily. 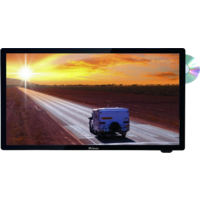 Great for off grid caravanning. The people at CaravanRVcamping were amazingly helpful! Dometic Harrier Inverter Air Condition. Absolutely wonderful & it's doing a fabulous job. Can't praise it highly enough. Purchased prior to going away and to their word it was dispatched on the day that I requested. Delivered the next day and the truck operator put it into my garage. Installation was a breeze and it was used over the weekend on a short trip. The air conditioner worked very well and was so much quieter than the old Coleman Mach. Having the added benefit of the remote made life easier. Thanks again CARAVANRVCAMPING. Always a pleasure to do business with you. Q) Our caravan has a roof opening of 360 mm x 360 mm, will the Dometic Harrier suit the aperture? and be a direct replacement? 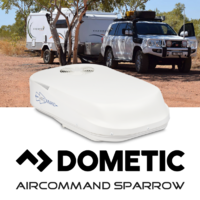 A) Yes, one of the most appealing features of the Dometic Harrier is that it comes with an adapter that suits most caravan, motor home roof apertures. 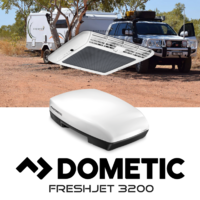 Most RV rooftop air conditioners will only come with two opening sizes, 360 mm x 360 mm or 400 mm x 400 mm the Dometic Harrier will cater for both openings there for being able to be a direct replacement for nearly all RV rooftop air conditioners. Q) What size generator can the Dometic Harrier be run off? Can I run it off my 2000w generator? A) The Dometic Harrier can be run off a 2000w generator as it is implemented with invertor technology which means it has very little start up draw enabling the operator to run the unit off a 2000w generator. Q) Is the Dometic Harrier Noisy? Can you hear the compressor kick in and out? A) The Dometic harrier is one of the quietest rooftop air conditioners on the market because of its inverter compressor technology, the compressor is running full time and will ramp up and ramp down to comply with the thermostats instructions. Other brand air conditioners you can hear the compressor kick in and out as it will completely stop once it has reached its required cooling or heating temperature there for giving a clunking noise in operation, the Harrier has eliminated all aspects of a noisy rooftop air conditioner. Q) We have a motor home which apparently has a thicker roof then a caravan, wanting to replace our existing rooftop air conditioner with the Harrier but noticed that it only caters for roof thicknesses from 30mm - 60mm. Is there a solution to this this problem? A) Yes, Dometic have provided an adaption kit, part number - 81-535-DUCT3 / Thicker Roof Seal - To Suit Dometic Harrier. 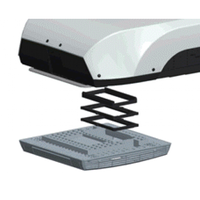 This kit will enable you to fit the unit to a roof thickness up to 108mm, there for making the Dometic Harrier one of the most universal rooftop air conditioners on the market. Q) I have an older roof top air conditioner about ten years of age, works fine just a little loud at night when trying to sleep. Does the Harrier have any special functions for night time? A) The harrier has an innovative sleep mode function which minimises the compressor speed and in addition to multiple variable fan speeds the Harrier will allow you to have a whisper quiet night's sleep.